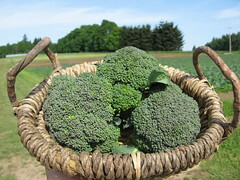 Note: All CSA members will receive the same quantity of broccoli during the course of the season, although some pick-up sites may receive their first share of broccoli during Week 1 and some may receive their first share in Week 2. Throughout the season we distribute several of our crops on a rotation schedule because of how they mature for harvest. Welcome to the first week of the CSA season. Each week we will post a CSA Newsletter to the blog that includes a photo and a list of the share, 3-5 recipes that correspond to the share for the week, and any farm news or community updates. 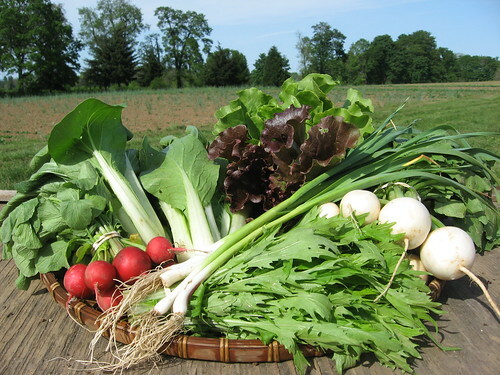 We hope you use the blog as a tool for connecting with the farm, finding new and creative ways to use your share, and looking ahead to what vegetables you will be receiving for the week. If you have any favorite recipes you want to share please email them to siorganics@aol.com and we will include them in the blog when appropriate. In the share list for most items you can click on the name and it will show you a photo and give you general information, cooking and storage tips, history, and any interesting field notes for that vegetable. Thanks so much for joining us this season, we look forward to growing for you these next 30 weeks. These little gems are enjoyed both fresh and cooked. Sliced and mixed in with a lettuce and mizuna salad is a quick and tasty way to use them. Wash lettuce, mizuna, and turnips. Leave the mizuna whole, and tear or chop lettuce into smaller pieces and place in salad bowl. After slicing the Hakurei turnips place them in the salad bowl as well. Add seeds or nuts as desired, dress, and toss. This dressing is great with fresh greens, sautéed greens, steamed vegetables, and cold meats as well as any other applications you may create for it. Place all ingredients in a container for mixing. You may use a blender or food processor to mix to your desired consistency or shake vigorously in a liquid tight container. Sauté the chopped green garlic in the oil for a few minutes until translucent. Add the turnips, the curry powder and salt and cook until everything is tender, about 10 minutes. Squeeze some lemon juice over the dish before serving and serve with extra lemon wedges. If you are serving this with rice get the rice started before making the stir-fry. Heat oil in wok or deep skillet. Stir-fry radishes, green garlic, broccoli, ginger, salt and pepper until radishes and broccoli softens slightly, 3-4 minutes. Add joi choi and rice wine vinegar mixture; cook 2 minutes. Sprinkle with soy sauce. Serve immediately over rice. Serves 4 if paired with rice. Note: Green garlic is featured in some of the other recipes above, but the recipe below calls for the entire 4 stems included in your share for this week. Cut root ends of green garlic and discard. Cut into 1-inch lengths, discarding the tougher green portions on top. In a saucepan over medium heat toast walnuts by cooking for several minutes, stirring constantly until they start browning. Place nuts and green garlic into a food processor or blender and pulse/process on low until roughly chopped. Cut cheese into chunks, add to blender/processor, and process. In a steady stream while blender/processor is running, add olive oil until desired consistency is reached. Salt to taste and keep in an airtight container in the refrigerator until ready to use. Use with pasta, served over fish, spread on bread, or in whatever way pleases your pallet. If you have to much to use for one meal you can keep in a covered container in the fridge for 7-1o days, or freeze for up 6 months (will freeze up to a year with no cheese added).